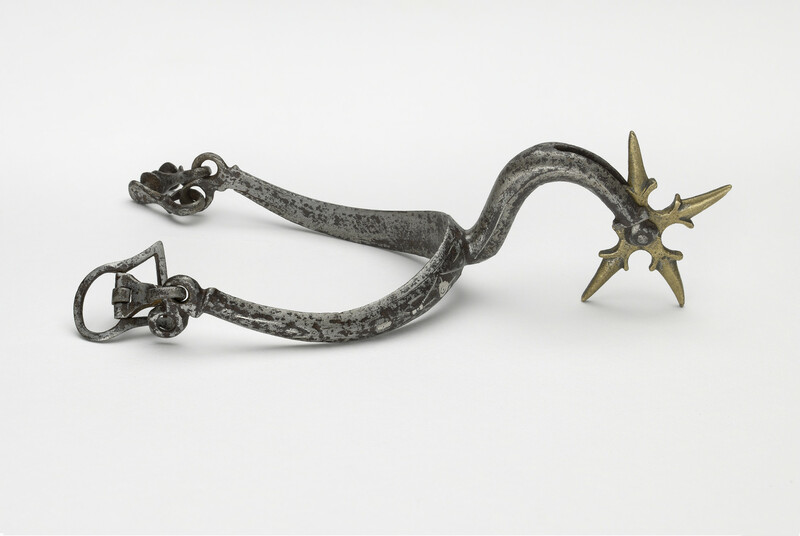 Rowel spur for the left foot with a body of russet iron having slender curved sides of D-section with swept figure-of-eight terminals, and a swan-like neck supporting a brass rowel originally of five long, evenly tapered points each with a small lug projecting from each side at its base (one point now missing). The outer surfaces are encrusted with silver in a trellis pattern originally having a large silver dot in each space (all now very worn). The decoration resembles that commonly found on the hilts of a group of hangers of about 1640-50, thought to be of English manufacture. Fitted in the left terminal is a plain, rather slender, U-shaped buckle without antennae and, in each of the right ones, an attachment with a small flat-headed button to receive the leather. Measurements: length of body 10.7 cm, width within the sides 7.0 cm, diameter of rowel 4.9 cm. Weight: 0.088 kg.